PrabhasMyHero Blog: 8 Reasons Why You Shouldn’t Miss Baahubali 2! The much awaited Baahubali 2 is all set to hit the theatres tomorrow. Here’s why you shouldn't miss this visual grandeur! The much awaited movie of the year is less than one day from embracing the theatres. It is touted to be the biggest ever motion film of Indian cinema and it's also a matter of days for box office records to stumble upon, post the release of the extravaganza. Though it is more or less sure that most of the audience would reserves their seats, grab their share of pop-corn and catch up with the movie in theatres, we still tried to bring out some strong reasons to give Baahubali 2: The Conclusion a definite try at the theatres. 1. Why Kattappa Killed Baahubali? The entire nation wants to know as the same has been treated as a national issue on a lighter note. Kattappa who would be caught between loyalty towards the King and affection towards Baahubali, could clearly be torn in two pieces and the loyalist in him, who follows the King's order would execute Baahubali's death. But what transpires him? If Amarendra Baahubali is the King of Mahishmathi, then who else could order Kattappa? Or would Amarendra Baahubali be succeeded by Bhallala Deva, who could have passed the order to Kattappa? Undoubtedly, an abundant eye feast is expected as the trailer itself comprised of some spectacular shots. Be it the design of an elephant carrying the bridge or the aerial view shot of Mahishmathi Kingdom or even the slider where Prabhas is seen gliding down. Songs such as Hamsa Naava and Saahore can be deemed to be made on a grand scale with rich backdrop and lighting. This will be epic & massive. Bhallala Deva, who would be seen taming a ferocious bull in Baahubali - The beginning and Amarendra Baahubali's son, Mahendra Baahubali who too looks extremely well-built, will lock horns for a heroic face off. 4. Why Bhalla Wants To Kill His Mother? 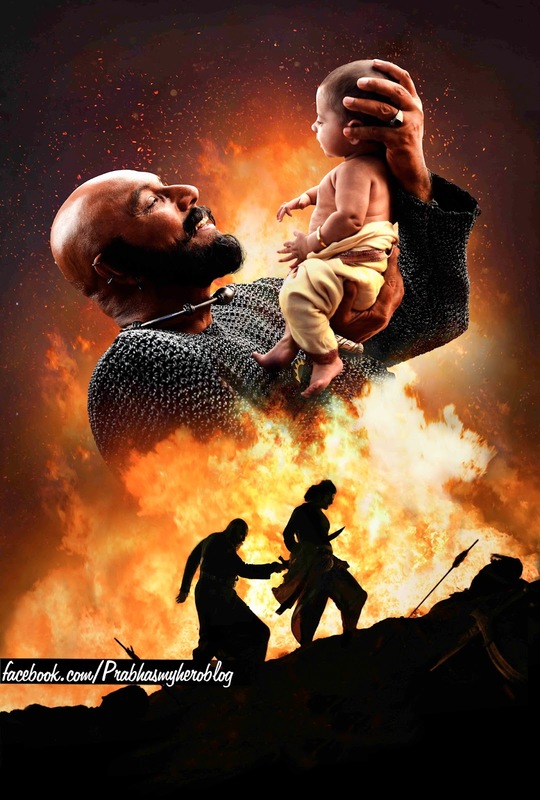 In a teaser which was released during the audio launch, Bijjala Deva asks his son, Bhalla about his possible intentions to slay his mother, Sivagami. The initial scene of Baahubali: The Beginning also shows Sivagami escaping the clutches of her own battalion which seems to be controlled by Bhalla. Could that possibly be due to Sivagami's positive nepotism towards Baahubali? If the first part boasted of some sensual sequences and song between Avantika and Shivudu, then wait for the second part which will provide the actual feel of romance in various dimensions. The supposed two way love track which involves two characters with beauty and brain could be seen in interesting song sequences of being orchestrated with limited dance and some sword fencing moves. Devasena would not just be seen as a glam doll who could pierce the heart of her King, Baahubali, but also as the fighting queen who could pierce the opposition with her skill and warrior ability. The physical personality of the actress too, complements the characterization of Devasena. It rendered instant goosebumps when the trailer begun with Amarendra Baahubali taking oath as the King of Mahishmathi. How electrifying would it be to witness Baahubali's maximum dynamism in taking oath as a king, with SS Rajamouli's taking and Keeravani's background music? A tailor-made shot for the actor's fans. The first part of the franchise proved the capability of Rajamouli in terms of executing war sequences. Be it the formation, equipment's used, ideation and the visual effects, all culminated to form one intriguing war sequence. The second part could easily be thrice as that of the first part's output as the expectations are riding high and that the war sequences would involve an epic clash between Mahendra Baahubali and Bhallala Deva which infuses more fervour and excitement into the scene.